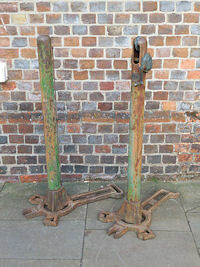 Original, quality late 19th century single hunting boot jack for pulling on leather boots. 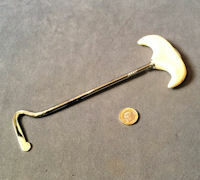 This example, originally one of a pair, has a serious shaped ivory grip, a silver mount and a chrome plated shaft and hook. All has been cleaned and lacquered and is complete and in good and working order. 9.25" x 3.5" x 0.5". Original, quality late 19th century telescopic coaching horn in nickel. This unusual example will slide down into half its length and is detailed to the flared end for the maker "Kohler & Son 118 Victoria Street Westminster (from Covent Garden)". All has been polished and lacquered and is complete and in good and working order with no dents or cracks. A super example. Full length 30" and short length 20.5" x 2.75". Original, quality circa 1900, copper coaching horn with a brass top neck section and mouthpiece, a rolled over rim to the flared end and engraved with the trumpet "trademark" for "Boosey & Co makers 295 Regent St London" Boosey & Co were at this address between 1874 and 1930 and "40080". Polished and lacquered, although the lacquer may be removed at no extra cost. Complete and in good and working order. 36.5" long and flared end 3.5" diam. Original, quality late 19th century "Ailsa Craig" granite curling stone with the original nickel handle. This super example is polished to the upper and lower sections leaving a band of textured granite finish around the centre and is engraved "A.B.S." for a previous owner. All in great condition and complete and in good and working order. 10.5" diam and 7" tall including handle. 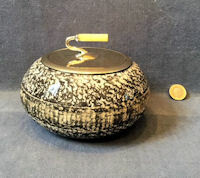 Original, quality late 19th century "Ailsa Craig" granite curling stone with the original nickel handle with an ebony grip. This super example is polished to the upper and lower sections leaving a band of textured granite finish around the centre and the nickel handle is engraved "D.G." for a previous owner. All in great condition and complete and in good and working order. 10.5" diam and 7" tall including handle. 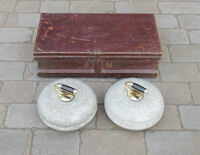 Pair of original, quality, late 19th century, 'Ailsa Craig' granite curling stones in the original wooden carrying box. This super pair of stones are polished to the top and bottom leaving a band around the centre with a texture. The brass handles are each engraved "J" and "N" and have ebony grips. The stones are both engraved "N" and "WN". The crate is in the original brown varnish finish, has a pair of wrought iron lifting handles, a brass hasp to the front and is engraved to the front "J.N.". The inside of the crate has provision for the two stones in separate compartments and the handles are stored in the slots loose from the stones. All is complete, in super condition and not often found in the original boxes. Crate 25" x 13" and 7.5", each stone 10.5" x 4.5" plus handles. 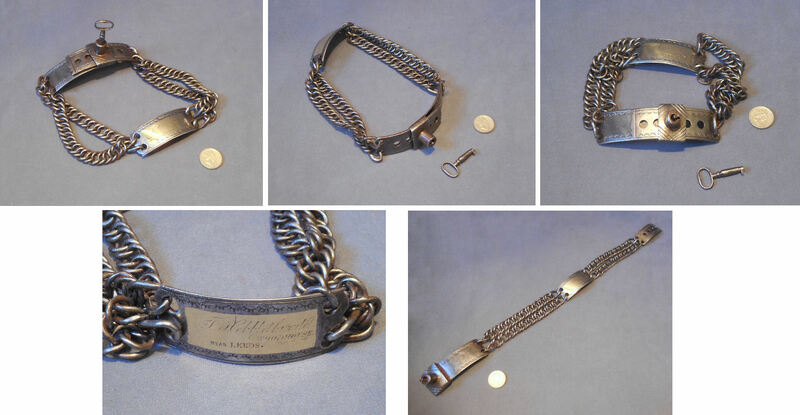 Original, quality, early to mid 19th century, blacksmith made wrought iron dog collar of a good size. 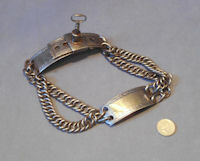 This example has two double rows of shaped links with a brass mounted nameplate between and adjustable and lockable joining plates with a old key altered to suit. The wrought iron curved plates are all punch engraved with detail and the inset brass nameplate details a name in script but very faint and "Woodside Nr Leeds". A fabulous dog collar. Complete and in good and working order. Total length 21" x 1.25". Original, quality near mint 1920's gentleman's top hat manufactured by Scott & Co of London with the original card box and velvet wipe. This super example has one minor blemish under the brim and one small hole in the lining, but otherwise is beautiful and showing no signs of more than the very occasional wear. The inner silk lining is detailed "by appointment Scott & Co hatters to the King & the Royal Family, 1 Old Bond St London W." and "Fritz Reuter Dusseldorf". The leather inner trim is impressed in gilt for both "Scott & Co" and "Fritz Reuter Dusseldorf". The box and velvet wipe are both detailed for "Fritz Reuter" and both have minor damage. Box 13" x 11" x 7". Hat 12" x 9.5" x 6.5". 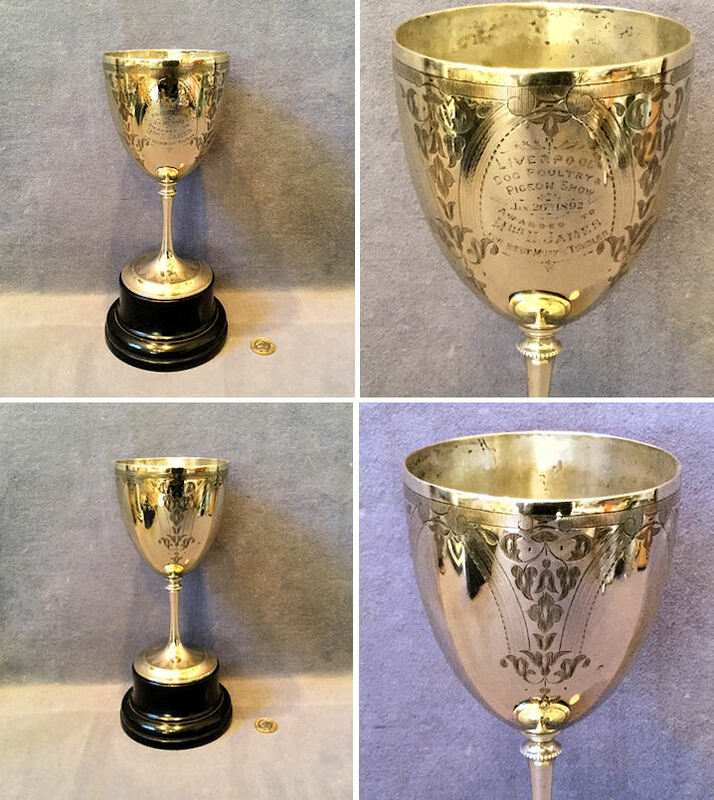 Original, quality 1920's nickel plated goblet shaped trophy with two side handles, engraved and embossed decoration to the cup and "Locks Heath Horticultural Society, Group Cup" engraved to the base. All in super condition, polished and lacquered, although the lacquer may be removed at no extra cost and complete and in good order. 6.5" tall, 5" wide including handles and 2.75" front to back. Base 2.75" diam. 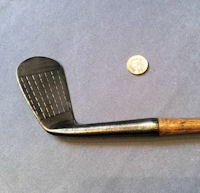 Original, quality 1920's hickory shafted golfing wood with an unusual handgrip shape, the original leather covering and a lead weighted head with a horn inset plate. 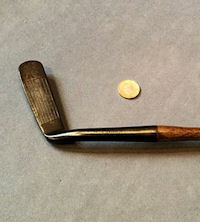 This example is stamped to the head and the shaft for the maker "F. Whiting Sandwich Royal St George's GC". Some later whipping repair and damage to horn inset, otherwise in super condition. 44.5" long and head 2.75" x 3.5". Original, quality 1920's hickory shafted golf club with a cast aluminium head and the original leather hand grip. The head is impressed "Medium Lie 9.2" and all has been cleaned, the head lacquered and the shaft and leather waxed. Complete and in good and working order. Shaft 35.5" x 0.75" and head 5" x 1.5" x 1". 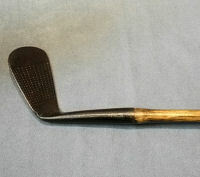 Original, quality 1920's hickory shafted golf club with a cast brass head and the original leather hand grip. The head is impressed "Anderson and Son Edinburgh". All has been cleaned, the brass head lacquered and the shaft and leather waxed and is complete and in good and working order. 38" x 0.75" and head 4" x 1.25". Original, quality 1920's hickory shafted golf club with a wrought iron head and the original leather hand grip. The head is impressed "Warranted Forged Putter" to the reverse. All has been cleaned, the head lacquered and the shaft and leather waxed and is complete and in good and working order. 33" x 0.75" shaft and head 4" x 1.5". 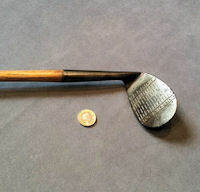 Original, quality 1920's hickory shafted golf club with a wrought iron head and the original leather hand grip. The head is impressed "Warranted hand forged" and "Niblick" and with the crossed swords logo for "Jus B. Hailcut. Co London". All has been cleaned, the head lacquered and the shaft and leather waxed and is complete and in good and working order. 36.5" x 0.75" and head 3.5" x 2.25". 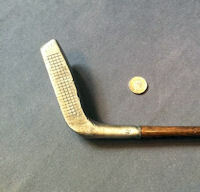 Original, quality 1920's hickory shafted golf club with a wrought iron head and the original leather hand grip. The head is impressed "D. Anderson and Sons St Andrews" and "Special Iron". 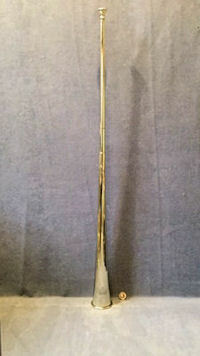 All has been cleaned, the head lacquered and the shaft and leather waxed and is complete and in good and working order. Shaft 40.5" x 0.75" and head 3.5" x 1.5". Original, quality 1920's hickory shafted golf club with a wrought iron head and the original leather hand grip. The head is impressed to the reverse "Warranted hand forged, made in Scotland, Special Gem Putter and W Gibson and Co Ltd Kinghorn Scotland". The shaft is impressed, 'Gibson Star A'. All has been cleaned, the head lacquered and the shaft and leather waxed and is in super condition. Shaft 35.5" x 0.75" and head 3.5" x 1". 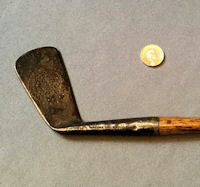 Original, quality 1920's hickory shafted golf club with a wrought iron head and the original leather hand grip. The head is impressed to the reverse "Warranted hand forged, Mashie, Jus B. Hailcut. Co London, Special" and with the crossed swords trade mark. All has been cleaned, the head lacquered and the shaft and leather waxed and is complete and in super condition. 39.5" long shaft, 0.75" head and 3.5" x 2". 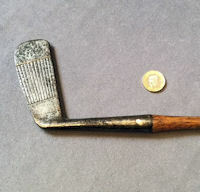 Original, quality, 1920's, hickory shafted golf club with a wrought iron head and the hard, but original, leather hand grip. The head is impressed to the reverse 'Warranted Hand Forged' and 'A5 Special Mashie'. All is very clean and complete and in good order. 36" x 4" x 1". 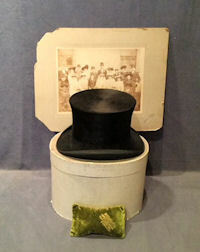 Original, quality gentleman's size 7 silk top hat in superb condition with the original card box, velvet brushing pad, wedding photograph of original owner when new in 1913 and other copies of related documents. The box is scruffy hence the hat is near immaculate with only some staining to the inner leather headband. The lining of this hat is detailed for the retailer "Billet & Co Faringdon Road Swindon" and the brushing pad was supplied and detailed as such for Billet & Co. The original sepia wedding photograph taken by "Protheroe & Simons Swindon" shows a William Boucher as the Bridegroom wearing this same hat. The actual photograph is in good order with just some damage to the surround. 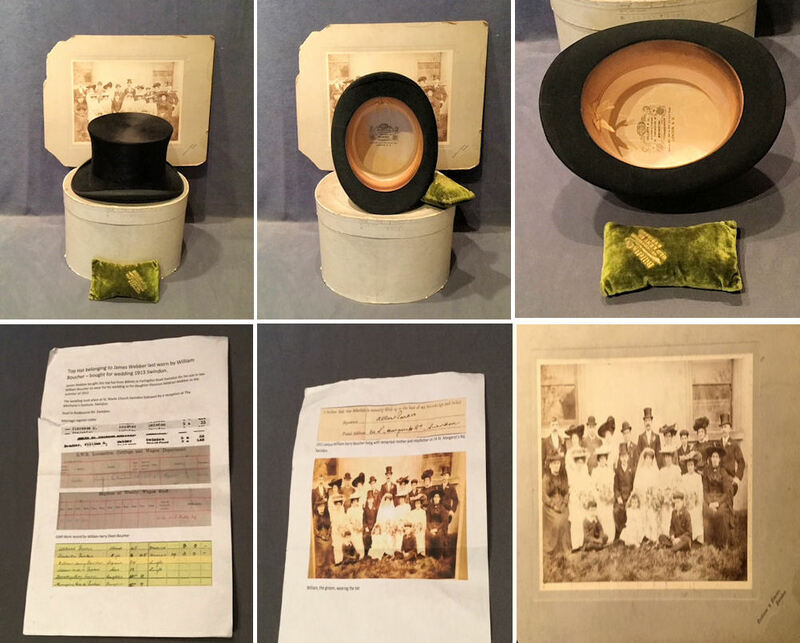 Two sheets of copies of various documents are also included detailing a potted history of this W. Boucher hat. Box 9" tall x 13" x 10.5" and pad 6.5" x 3.5" x 2". Photo 18" x 14". 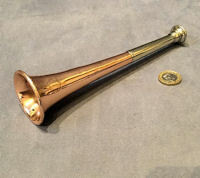 Original, quality 1920's / 30's copper hunt horn with a nickel mouthpiece and neck and a rolled over flared end. This very clean example is detailed to the flared end "Swaine & Adeney London, Proprietors of Kohler & Son and Made in England". Polished and lacquered, although the lacquer may be removed at no extra cost. Complete and in good and working order. 9" and 1.5/8" widest. 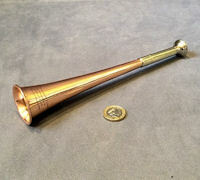 Original, quality late 19th century copper hunt horn with a nickel neck and mouthpiece and a rolled over end to the flare. This very clean example is impressed with logo for the retailer "The Army & Navy Co.Operative Stores Ltd". Polished and lacquered and complete and in good and working order. 8" long and 2" flared end. 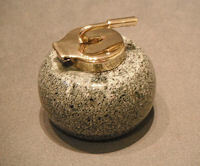 Original, quality 1920's, ceramic inkwell in the form of a granite curling stone, with a flecked finish and a hinged brass lid with the 'curling stone' handle attached. A realistic scaled down copy of the real thing, complete and in good order. The brass has been polished and lacquered, although the lacquer may be removed at no extra cost. 2.5" diameter x 2.25" tall. 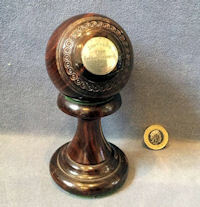 Original, quality miniature lignum vitae bowling wood on the original matching stand. The bowl has carved detail, a fine polished finish and an engraved silver disc inset to each side. Side one "Southend Open Bowling Tournament 1936" and Side 2 "H.E.J". A super presentation piece. Complete and in good order. Total 5.5" tall x 2.5". 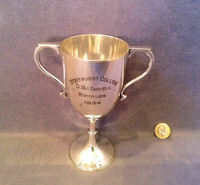 Original, quality pre-war silver plated trophy cup with side handles and mounted on a black bakelite plinth. This very clean example is engraved to the front "Wells & District Shove Ha'penny League, Pairs K.O. Cup presented by The Taunton Cider Co Ltd". No wear to the silver plate and complete and in good order. 9.5" tall including handles, 8.75" wide including handles and 5.75" front to back. 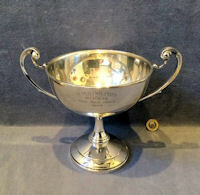 Original, quality silver plated sporting trophy with two side handles and engraved to the front "Stonghurst College, D. Mc Dowell Hurdles 1934". The underside is stamped for the manufacturer "Angle Plate W.H & S.E.P". Some rubbing to the plating, otherwise complete and in good order. 6.5" tall, 5.25" wide including handles and base 2.5" diam. Original, quality early to mid 19th century two section brass shot measure for muzzle loading guns. This example has the original steel sprung spine to close the end flaps one, of which is stamped "Oz2". No maker's name but a good early example with some minor dents, otherwise complete and in good and working order. Polished and lacquered, although the lacquer may be removed at no extra cost. 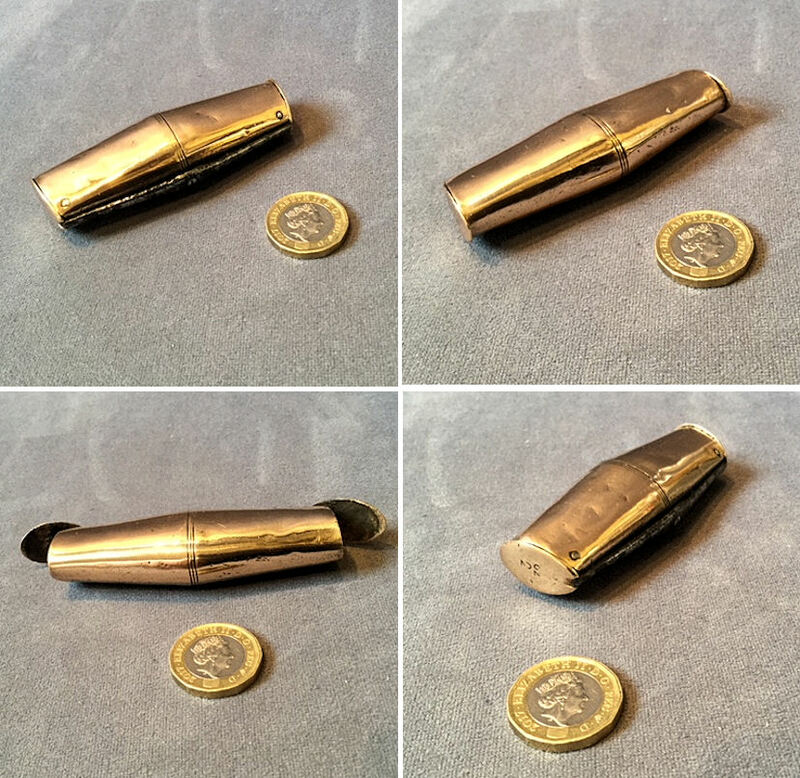 3.25" x 1.25" x 0.75". Original, quality, late 19th century, cartridge tamper turned in boxwood. Used when reloading 12 bore shotgun cartridges to push down the wadding. Complete and in good order. 6" x 1". 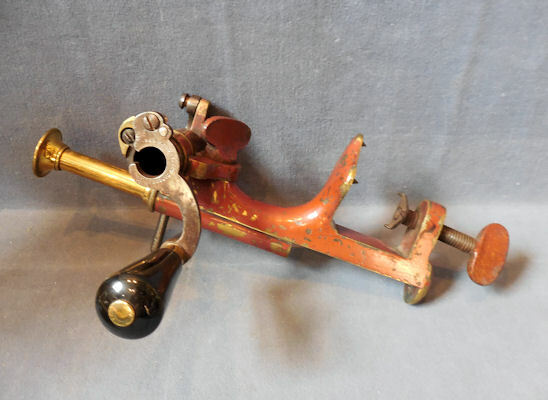 Original, quality, 19th century, '12 bore' central fire shotgun cartridge loading and closing machine, with a bench clamp mounting and horn grip. This model with a brass main body has most of the original red/brown paintwork and is stamped for the maker 'G & J.W' Hawksley's patent'. Complete and in good and working order. 11" long. 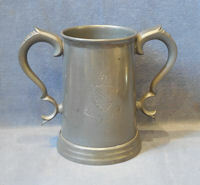 Original, quality late 19th century Quart sized pewter tankard with a side handle and a glass bottom. The front is engraved "Winner of the college Sweepstakes" with a coat of arms & "Floreat Etone" an Eton College Sporting Trophy". Some scuffs to the front of the top rim, otherwise a good colour and complete and in good order. 6.25" tall, 7.25" wide including handle and base 4.75" diam. 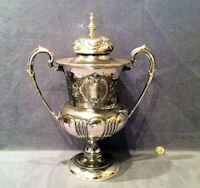 Original, quality silver plated trophy in the form of a cup with Art Nouveau side handles, a narrow stem and a circular foot. 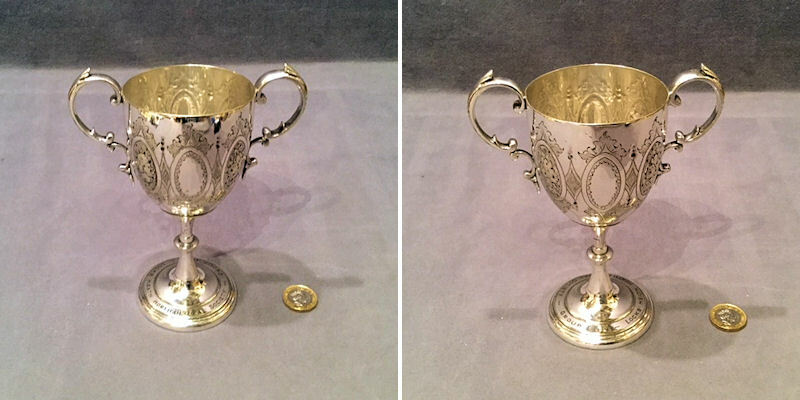 The underside is impressed "EPNS" and with the maker's stamp for Walker and Hall and the cup is engraved "H.M.S. Dolphin 1st Prize One Mile Open 1924". A very clean example with no wear to the plate, complete and only one very minor dent. Polished and lacquered, although the lacquer may be removed at no extra cost. 7.5" tall, total width 9", bowl 6" diam and base 4" diam. Click on photo fo rlarger and other views. 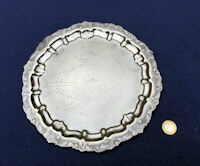 Original, quality circular silver plated drinks tray with a decorated outer rim detailed to the reverse for the manufacturer "Walker & Hall" and "Reproduction of Old English Plate" and "mounts stamped from the original Boulton & Watt dies circa 1774". The front is engraved "Presented to The National Director of Coaching, Martin Horton In Appreciation. Auckland Association 1984". A very clean tray in near mint condition. 14.5" diam x 0.5". 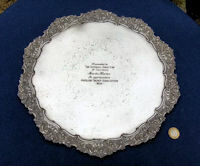 Original, quality circular stainless steel drinks tray with a decorative rim and engraved facsimile signatures of presumably the Australian or England Cricket Teams of 1936 or some of each. A clean example. Complete and in good order. 10" diam x 0.25". Original, quality barrel shaped nickel tankard with a side handle and a glass bottom. 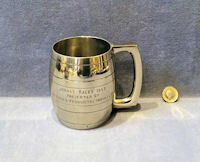 This ale tankard has been engraved and presented as a sporting trophy and detailed "Jorhat Races 1957 Presented by Nestle's Products (India Ltd)". Polished and lacquered and complete and in good and working order. 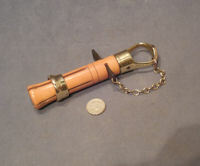 4.25" tall, 3.75" widest and 5" including handle. Original, quality late 19th century copper powder flask with brass top collar and mounts and marked for the maker "J. Dixon & Sons". This slimmer version is complete and in good and working order, with a good steel lever spring and adjustable spout. A good clean seam repair and some very minor dents and has been polished and lacquered, although the lacquer may be removed at no extra cost. 8" x 2.5" x 1.25". 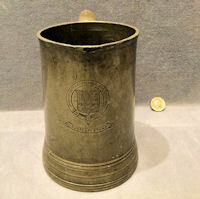 Original, quality late 19th century pewter half pint tankard stamped with a 'VR' customs stamp beneath the rim. 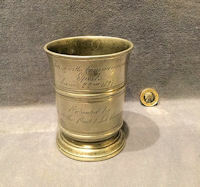 This super shaped tankard has been engraved in script as a sports trophy and detailed to the front "Maisworth Commemoration Sports June 22nd 1897" and "Presented by Messrs Thos Piatt & Job Chappin". Complete and in good order. 4" tall, top diam 3" and 4.5" wide including handle. 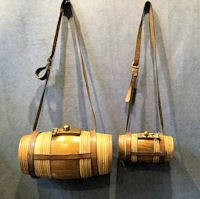 Original, quality pre-war canvas cartridge shoulder bag with leather fittings, brass buckles and a webbing shoulder strap. This very clean example has no signs of wear although the canvas body is a little faded. The reverse is impressed '50' for the number of cartridges it will carry. Complete and in good and working order. Bag 9.5" x 8" tall + 3" front to back approx. Strap 2" x 22" tall as on bag. 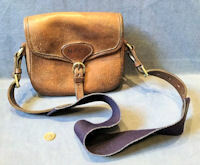 Original, quality 1920's all leather and pigskin cartridge bag with the original shoulder strap and brass fittings. This very clean example is detailed "M.F.C.F." for the previous owner and "English Saddlery Cirencester" for the maker and "1.85". No signs of wear and the interior is particularly clean. All very usable and complete and in good and working order. Bag 11" wide x 9" tall x 4" front to back. Original, quality 1920's 'Carlton Ware' ceramic sugar bowl with a nickel rim and lid with a bone grip to the handle. This super example is in the very realistic form of a granite curling stone, it even has the coarse band of simulated granite to the centre. The underside is transfer printed with the logo for "Carlton Ware Stoke on Trent". Perfect and complete. 4" tall including the lid and 5.5" diam. 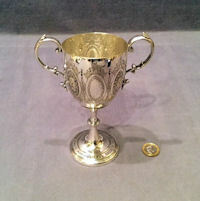 Original, quality silver plated trophy in the egg cup shape engraved to the front "House Sports, G.S. Shephard, 2nd in Mile, Eton 1900". A very clean trophy. Complete and in good order. 6" tall and 2.5" widest. 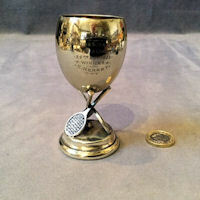 Original, quality small nickel Tennis Trophy, egg cup size with a stand in the form of three tennis racquets. 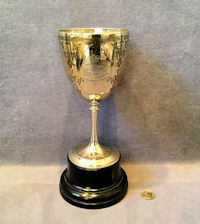 The cup is engraved "Tylers Ltd, Sports & Social Club Ladies Tennis Championship 29th Oct 1943 Winner, E. Merret". Polished and lacquered and complete and in good order. 3.75" tall and 2" diam plinth. Original, quality 1920's Britannia metal two handled Billiard trophy with the original cover and engraved "St Joseph's Club Brindle Billiard Cup & presented for the years 1920 to 1925 to J. Thomspon. 1920, to A. Walmsley. 1921 / 1922 / 1924, to J. Walmsley. 1923, to W. Ashton 1925. This super example is complete and in good order but with the nickel plating well rubbed showing the pewter type metal bleeding through. Polished and lacquered, although the lacquer may be removed at no extra cost. 16.5" tall including lid, 13" wide including handles and 8" front to back. Original, quality late 19th century nickel plated goblet shaped Trophy on an ebony plinth. This example is engraved with four panels for details of awards. 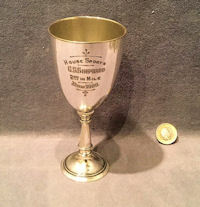 One panel is engraved "Liverpool Dog Poultry & Pigeon Show Jan 26th 1892, awarded to Mrs H James for best Muff Tumbler". Although the plating is worn the engraving is sharp and clear and all is complete and in good order. This item was purchased during the filiming of an episode of Dickinson's Real Deal on location at Stafford. Trophy 8.25" tall and 4" diam. Total on plinth 10.75" tall and plinth 4.75" diam. 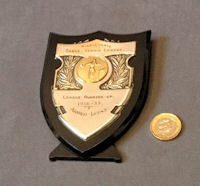 Original, quality 1950's nickel plated shield shaped trophy mounted on a bakelite shield with an easel backstand. Engraved "Ribblesdale Table Tennis League, League Runners Up 1956-57 Arnold Lucas". Polished and lacquered, although the lacquer may be removed at no extra cost. Complete and in good order. 4.5" tall x 3.5" wide and when standing 2" front to back. 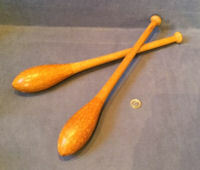 Original, quality pair of 1920's exercise clubs always referred to as "Indian Clubs". This pair turned in ash appear unused and have retained all the original finish. Each grip is impressed to the top '0' for the size, and all is complete and in good and working order. 17" x 2" widest. 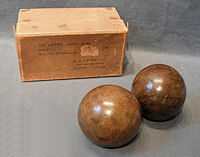 Original, quality pair of late 19th century lignum vitae bowling woods. This pair does have a few minor splits to the grain but otherwise is complete and in good order. These are impressed to the wood for the maker "Thomas Taylor of Glasgow", and each have two inlaid ivorine plaques, one engraved 'C.Y' to each side for the original owner and the other the numbers '1' and '2'. Lignum Vitae is heavy and hard and one of the few woods that with not float. 5" diam. 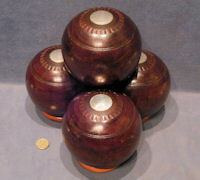 Original, quality late 19th century, set of four matching lignum vitae bowling woods with inset ivorine discs to each side. This superb set are impressed to the wood for the maker "Thomas Taylor of Glasgow" and engraved to the ivorine disc with the monogram of the original owner to one side and the numbers '1' to '4' to the other. No splits or cracks and complete and in good order. Lignum Vitae is heavy and hard and one of the few woods that with not float. 5" diam. Price is for the set. Original, quality boxwood and brass tool to assist in re-tipping billiard cues. 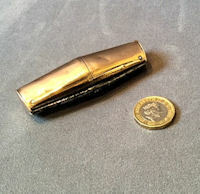 Complete with the slide down locking ring and the rasp to remove the remains of the old tip, stamped to the brass collar with the registered date 1916. All appears unused. and brass has been polished and lacquered, although the lacquer may be removed at no extra cost. Complete and in good and working order. 6.5" x 1.25" body. Price is for each. 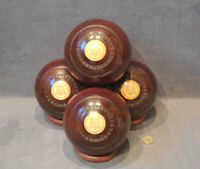 Set of four original, quality late 19th century lignum vitae bowling woods with inlaid silver discs to each end. This superb set, free from splits or cracks, are impressed to the wood for the manufacturer "Thomas Taylor of Glasgow" and the silver discs are engraved one side of each, with the original owner's monogram "JM" or "IM" and to the other sides "1" to "4". Complete and in good and working order. 4.5" diam. Price is for the set. Original, quality pair of late 19th century lignum vitae bowling woods with ivory discs to each side. One side is engraved "1" and "2" and the other with "P.C" for the original owner. Both are also impressed for the maker "R.O. Lawrie Glasgow". Lignum Vitae is heavy and hard and one of the few woods that will not float. Some minor splits to the grain otherwise complete and in good order. 5" diam. 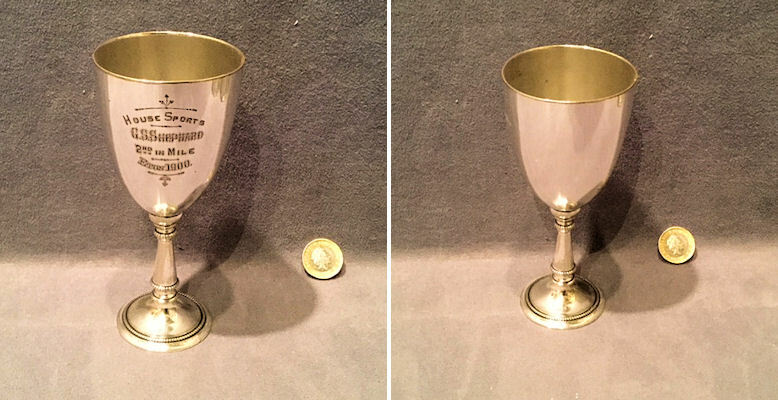 Original, quality, quart sized pewter two handled rowing trophy engraved "Clare College Junior Trial Eights 1906" with the coat of arms over "Care Adsum" to one side and the list of team members to the other "F.Ferraboschi, V.G. Shaw, C de M Schumitz, F.W.C. Douglas, S.C. Asklin, G. Aydon. E.T. Cutler, H.J. Newton Clare, C.H. Fisher and R.C. Martin the coach". The underside has a clear glass bottom and is stamped for the maker "Munsey Cambridge". All is complete and in good order and with a good warm pewter colour. 6.5" tall x 8.75 " wide including handles and 4.75" base diameter. 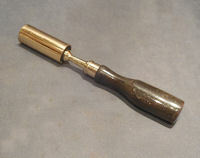 Original, quality, late 19th century, brass shafted breech cleaning brush for a 16 bore shotgun. This fine example is detailed to the brass neck for the manufacturer "Coggswell and Harrison" and "16" for the size. The hand grip is made from cow horn and a brass cover to protect the brush has been made to suit, copied from an original. All has been polished and lacquered, although the lacquer may be removed at no extra cost. All is complete and in good and working order. 7" x 1" and 0.5". Original, quality, pewter tankard of a super Art Nouveau shape, with a tendril shaped sinewy loop side handle. 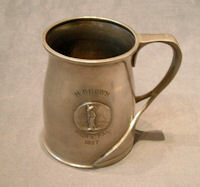 The front has an applied pewter cameo of a golfer and the tankard is engraved "H.Brown" above and "From A Pal 1927" below. The underside is stamped "Baronial Pewter", "75" and "Glossoid Co Holborn Viaduct" for the retailer. A super tankard, in a great colour. Complete and in good order. Base 3.75" diameter x 4.5" tall and 5.5" widest including handle. Original, quality, late 19th century, bowling wood turned from lignum vitae with three ivory inlaid dots, Has been refinished and is complete and in good order. Lignum Vitae is heavy and hard and one of the few woods that with not float.4.5" diameter. 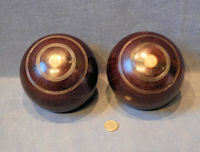 Pair of original, quality, lignum vitae carpet bowling woods, in the original card box. The box details " The Lawrie Carpet Bowl, Used By All The Champions" and "R.G.Lawrie LTD, Carpet Bowl Manufacturers, Glasgow, Scotland". Complete and in good order. Lignum Vitae is heavy and hard and one of the few woods that with not float. 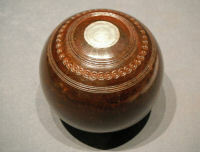 Box 8" x 4.25" x 4.25", bowling woods 3.5" diameter. 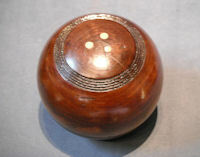 Original, quality lignum vitae bowling wood with two silver inserts, one with "1" and the other engraved "Wilts County Singles Championship 1939, Presented By RCBC". The wood is also impressed for the maker "Jaques and Son, London", '5' and 'Bias No3' and with a decorated carved frieze to both ends. A super example with provenance. Lignum vitae is one of the few woods that will not float. 4.75" diameter. 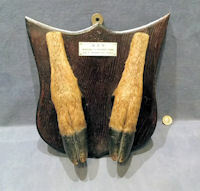 Original, quality pair of red deer hooves mounted on an oak shield shaped board with a wall hanging eye and an ivorine plaque detailing "Q.S.H" for the Quantock Stag Hounds in Devon and "Windown to Hayman's Pond A.M.L.Y 4th April 1953 E.S.G.Y. Well mounted and in good order. Shield 11.75" x 11.25" x 0.75". Total 3.5" front to back including hooves. 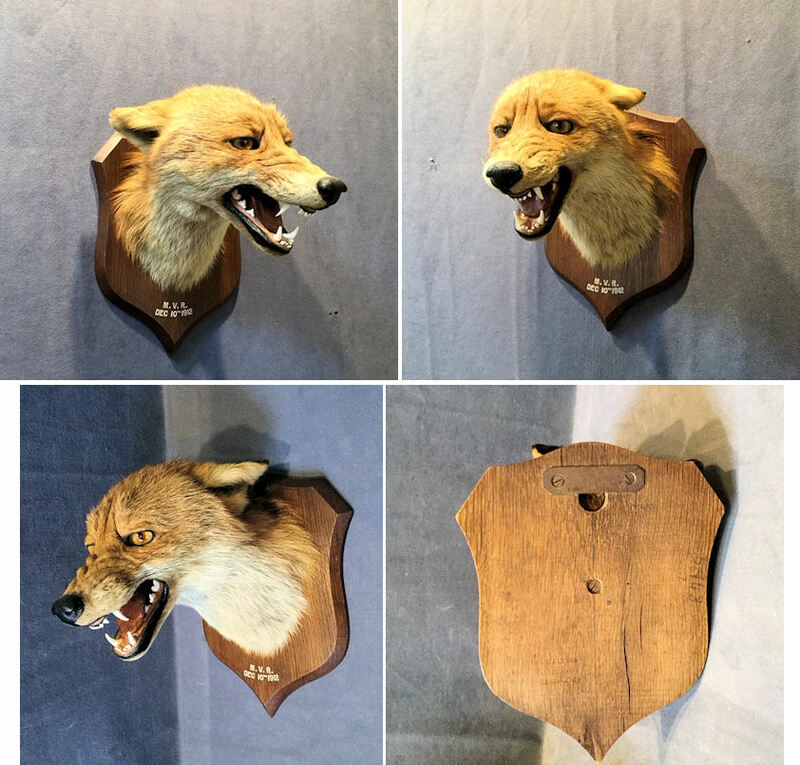 Original, quality superb mounted fox mask on the original oak shield. 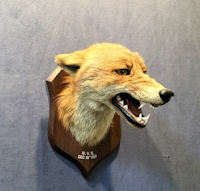 This example was mounted by "Spicers of Leamington" the famous taxidermist of hunt trophies and similar. The condition is outstanding in every detail and the original shield in the standard Spicers' shape is impressed to the reverse "P.Spicer & Sons Taxidermist Leamington" and is detailed to the front "M.V.R Dec 10th 1912". Complete and in good order. Backboard 10.75" x 8.25" x 0.75". total including shield 11" front to back. 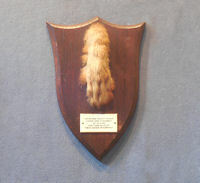 Original, hare's foot, quality mounted on an oak shield. Impressed to the reverse for "P.Spicer and Sons Leamington" and with the number "3578". The foot, in full fur, is mounted to the front above the ivorine plate detailing "Crowcombe Basset Hounds, Escob Farm, Stogumber, Oct 10th 1951. First Hare Killed By These Hounds In Somerset". A well presented piece of hunting memorabilia, very unusual to be Basset Hounds and not Beagles. Complete and in good order. Shield 8" x 5.5". Original, quality pair of 1920's iron tennis net posts with the original "Soft Ground" cast iron bases and the top wire winding mechanism in brass. The bases are embossed " B.Hirst and Sons Halifax" for the manufacturer and " New Plus Ultra Patent". Some of the original green paintwork remains. Small part of the base extension missing but otherwise all is complete and in good and working order. 42" tall, poles 2.75" diam and base 27" x 15". Price is per pair. 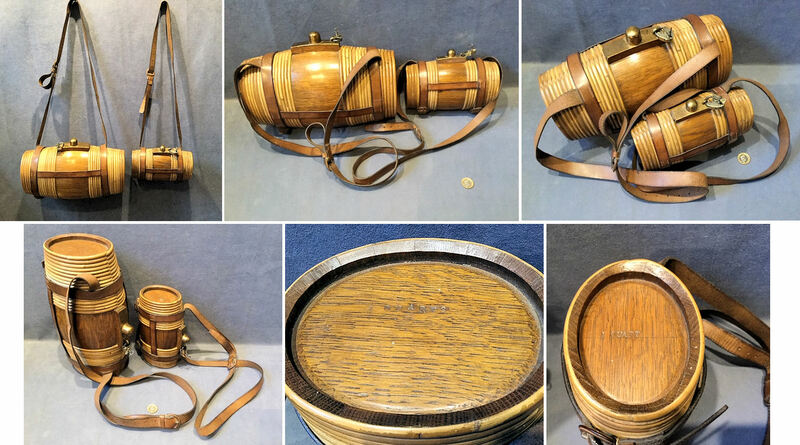 Original, quality matching pair of late 19th century Scottish costrell shaped whisky flasks in unbelievable condition. Each one is bound in cane and fitted with the original shoulder straps and barrel harness, brass bung cover and brass padlock with key. The brass covers are stamped "H.G.M" for the original owner and the barrels are impressed to one end "1 Quart" and "4 Quarts". All is complete and in good and working order and all are as they came, with one exception, replacement keys were altered to suit, note also the brass padlocks which came with the flasks are a true pair. These flasks were carried by deerstalkers. Barrel large 13" x 9.5" x 6.5". Barrel smaller 8" x 5.5" x 3.5".